“Why Self-Policing Is Not Sufficient”, www.responsbilehomeschooling.org, Coalition for Responsible Home Education; September 15, 2014. “When Homeschool Dreams Meet Reality”, www.responsiblehomeschooling.org, Coalition for Responsible Home Education; June 17, 2014. Chicken Soup for the Soul: Miracles Happen “New Direction”, Chicken Soup for the Soul LLC; February 2014. “Imagining the Resurrected Life” (Sermon on Luke 20:27-38; 25th Sunday after Pentecost, Year C), www.DesperatePreacher.com; November 10, 2013. “Hooray for Me!” (Sermon on Luke 17:5-10; 20th Sunday after Pentecost, Year C), www.DesperatePreacher.com; October 6, 2013. “A House Divided, A World Divided” (Sermon on Luke 12:49-56; 13th Sunday after Pentecost, Year C), www.DesperatePreacher.com; August 18, 2013. “Your Name is Not Legion” (Sermon on Luke 8:26-39; 5th Sunday after Pentecost, Year C), www.DesperatePreacher.com; June 30, 2013. “God of Relationship” (Sermon on John 17:20-26; 7th Sunday of Easter, Year C), www.DesperatePreacher.com; May 12, 2013. “God’s Home with Us” (Sermon on John 14:23-29; 6th Sunday of Easter, Year C), www.DesperatePreacher.com; May 5, 2013. “Living Psalm 23” (Sermon on Psalm 23, John 10:11-18; 4th Sunday of Easter, Year C), www.DesperatePreacher.com; April 21, 2013. “Proof of Life” (Sermon on John 20:19-31; 2nd Sunday of Easter, Year C), www.DesperatePreacher.com; April 7, 2013. “What Are You Looking For?” (Sermon on Luke 24:1-12; Easter Sunday, Year C), www.DesperatePreacher.com; March 31, 2013. “Name Calling” (Sermon on Isaiah 50:4-9a, Luke 19:28-40, Luke 23:1-49; Palm Sunday, Year C), www.DesperatePreacher.com; March 24, 2013. “How Your Devotion Impacts the World” (Sermon on John 12:1-8; 5th Sunday in Lent, Year C), www.DesperatePreacher.com; March 17, 2013. “Transfigured and Transformed” (Sermon on Luke 9:28-36; Transfiguration Sunday, Year C), www.DesperatePreacher.com; February 10, 2013. “Comfortable and Familiar?” (Sermon on Luke 4:21-30; 4th Sunday after Epiphany, Year C), www.DesperatePreacher.com; February 3, 2013. “Risky Symbols and Small Miracles” (Sermon on John 2:1-11, Isaiah 62:1-5; 2nd Sunday after Epiphany, Year C), www.DesperatePreacher.com; January 20, 2013. “What God Has Done in Baptism” (Sermon on Luke 3:15-17, 21-22, Isaiah 43:1-7; Baptism of Our Lord, Year C), www.DesperatePreacher.com; January 13, 2013. “John’s Tough Love” (Sermon on Luke 3:7-18; 3rd Sunday of Advent, Year C), www.DesperatePreacher.com; December 16, 2012. “Something’s Coming” (Sermon on Luke 21:25-36, 1 Thessalonians 3:9-13; 1st Sunday of Advent, Year C), www.DesperatePreacher.com; December 2, 2012. “What is a King?” (Sermon on John 18:33-37; Christ-the-King Sunday, Year B), www.DesperatePreacher.com; November 25, 2012. “What About That Tongue” (Sermon on James 3:1-12, Mark 8:27-38; 16th Sunday after Pentecost, Year B), www.DesperatePreacher.com; September 16, 2012. “Sign, Sign, Everywhere a Sign” (Sermon on John 6:35, 41-51; 11th Sunday after Pentecost, Year B), www.DesperatePreacher.com; August 12, 2012. “Ordinary Miracles” (Sermon on John 6:1-21; 9th Sunday after Pentecost, Year B), www.DesperatePreacher.com; July 29, 2012. “Discipleship Needs” (Sermon on Mark 6:30-34, 53-56; 8th Sunday after Pentecost, Year B), www.DesperatePreacher.com; July 22, 2012. “Being a Prophet” (Sermon on Mark 6:14-29, Amos 7:7-15; 7th Sunday after Pentecost, Year B), www.DesperatePreacher.com; July 15, 2012. “Not a Zero-Sum Reality” (Sermon on Mark 5:21-43; 5th Sunday after Pentecost, Year B), www.DesperatePreacher.com; July 1, 2012. “What It’s All About” (Sermon on John 15:9-17; 6th Sunday of Easter, Year B), www.DesperatePreacher.com; May 13, 2012. “A Convenient Story” (Sermon on Acts 8:26-40; 5th Sunday of Easter, Year B), www.DesperatePreacher.com; May 6, 2012. “Living Psalm 23” (Sermon on Psalm 23, John 10:11-18; 4th Sunday of Easter, Year B), www.DesperatePreacher.com; April 29, 2012. “Why It Matters” (Sermon on Luke 24:36b-48; 3rd Sunday of Easter, Year B), www.DesperatePreacher.com; April 22, 2012. “Snakes and Faith” (Sermon on John 3:14-21, Numbers 21:4-9; 4th Sunday in Lent, Year C), www.DesperatePreacher.com; March 18, 2012. “Repent, and Believe in the Good News” (Sermon on Mark 1:40-45; 6th Sunday after Epiphany, Year C), www.DesperatePreacher.com; February 12, 2012. “Responding to the Call” (Sermon on Jonah 3:1-5, 10, Mark 1:14-20; 3rd Sunday after Epiphany, Year C), www.DesperatePreacher.com; January 22, 2012. 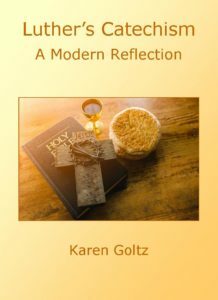 “Understanding Baptism” (Sermon on Mark 1:4-11; Baptism of Our Lord, Year C), www.DesperatePreacher.com; January 8, 2012. “Catching Glimpses of God” (Sermon on Luke 2:22-40; 1st Sunday after Christmas, Year C), www.DesperatePreacher.com; January 1, 2012. “Investing Jesus-Style” (Sermon on Matthew 25:14-30; 22nd Sunday after Pentecost, Year B), www.DesperatePreacher.com; November 13, 2011. “Biblical Hope” (Sermon on Matthew 25:1-13, 1 Thessalonians 4:13-18, Amos 5:18-24; 21st Sunday after Pentecost, Year B), www.DesperatePreacher.com; November 6, 2011. “The Things That Are God’s” (Sermon on Matthew 22:15-22; 18th Sunday after Pentecost, Year B), www.DesperatePreacher.com; October 16, 2011. “God’s Party” (Sermon on Matthew 22:1-14; 17th Sunday after Pentecost, Year B), www.DesperatePreacher.com; October 9, 2011. “Tending the Vineyard” (Sermon on Matthew 21:33-46, Isaiah 5:1-7, Psalm 80:7-15; 16th Sunday after Pentecost, Year B), www.DesperatePreacher.com; October 2, 2011. “Playing the Blame Game” (Sermon on Ezekiel 18:1-4, 25-32, Matthew 21:23-32; 15th Sunday after Pentecost, Year B), www.DesperatePreacher.com; September 25, 2011. “The Unfairness of God” (Sermon on Matthew 20:1-16; 14th Sunday after Pentecost, Year B), www.DesperatePreacher.com; September 18, 2011. “Trying to Keep a Weed-Free Church” (Sermon on Matthew 13:24-30, 36-43; 5th Sunday after Pentecost, Year B), www.DesperatePreacher.com; July 17, 2011. “What Kind of Soil Are You?” (Sermon on Matthew 13:1-30, 36-43; 4th Sunday after Pentecost, Year B), www.DesperatePreacher.com; July 10, 2011.